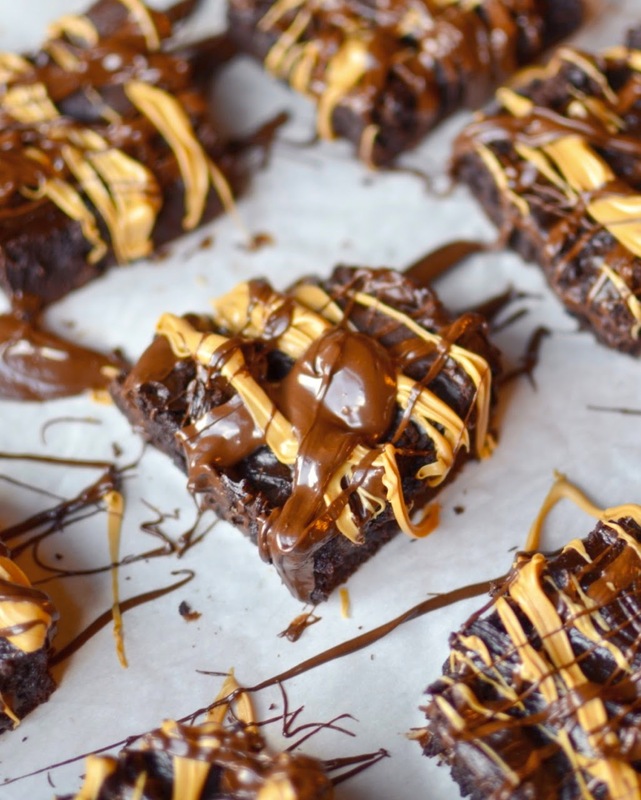 See these beautiful, chocolatey, peanut buttery, fudgy brownies of bliss? Can you comprehend the fact that they are also dairy free, butter free, gluten free, and flour free? Well, here's the shameful thing... I was not actually ever going to post these beautiful brownies. See, after I took all the time and work to photograph them, I cross-examined my sister (as usual) so see if she thought they were really fabulous enough to post. After a very thorough interrogation, I finally got her to admit that she "thought I had made better ones before, but these were pretty good". Whether this was only because of her indifference to that elixir of life that is peanut butter or whether they really were less spectacular than usual, I don't know. It did make me second guess them myself though. The days I took deliberating whether or not I should post them turned to weeks, and the weeks turned to months. Then one fateful day (that would be today) I looked at the photos in my trusty old arsenal and said to myself, "What was I thinking!?! THESE LOOK FABULOUS." 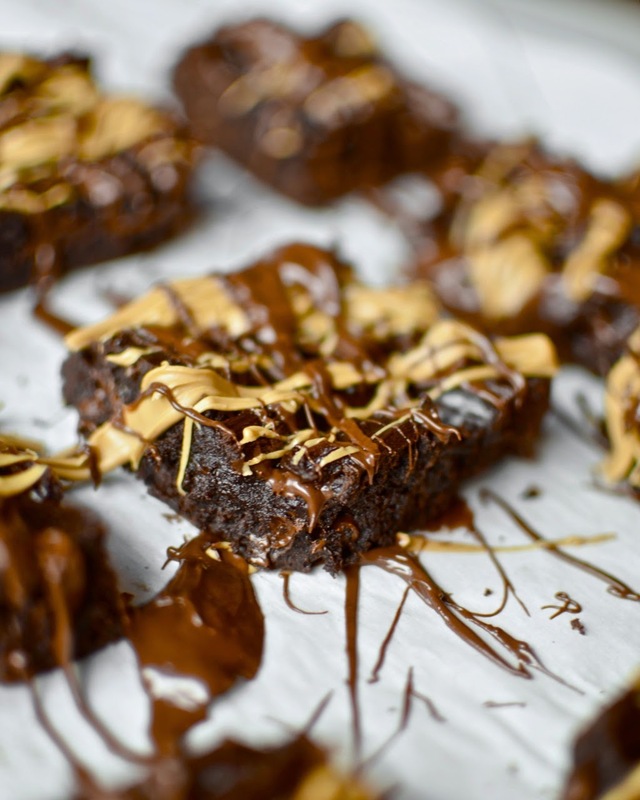 Besides, these are great brownies if you want to be dairy free on the cheap since there's no coconut oil or anything. Oh, and this photo below is just the batter. 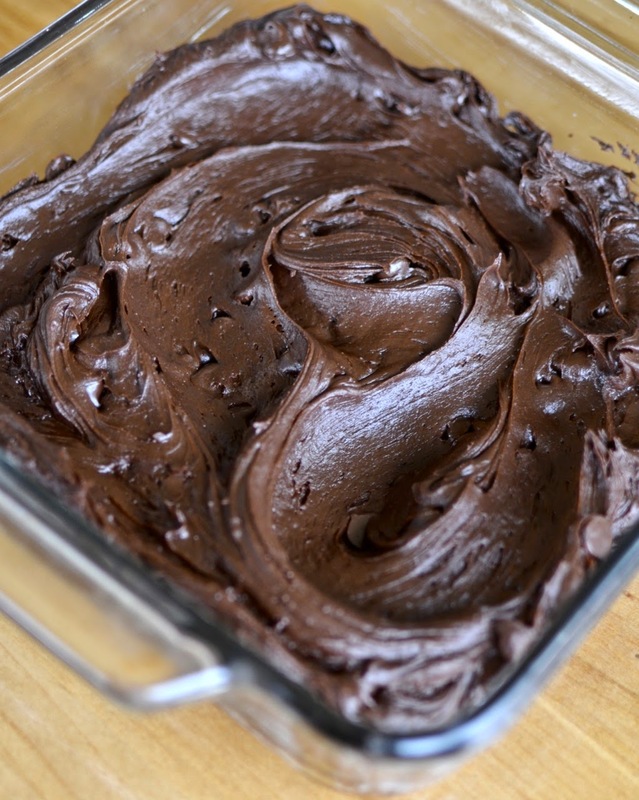 Don't get all excited thinking I made this thick and creamy chocolate frosting or anything. 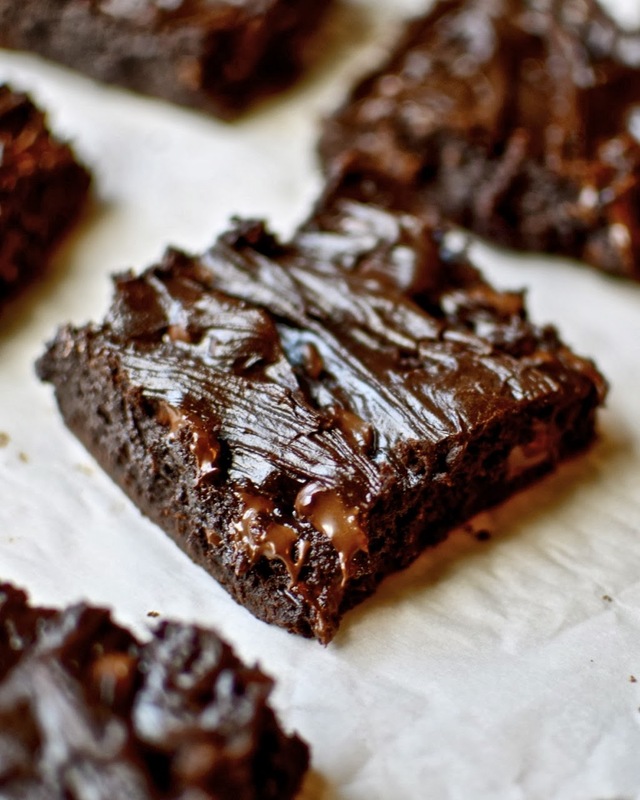 Anywho, make these brownies and let me know what you think. 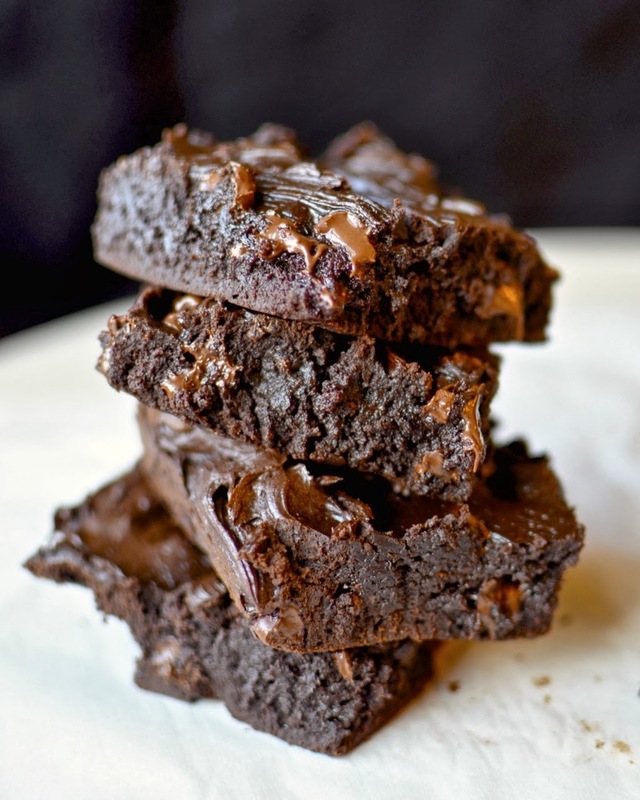 Be aware that the texture is different than butter brownies. Do let me know your opinion though. Good day. Preheat the oven to 350ºF and grease an 8x8 inch pan. Melt the peanut butter and 3/4 cup chocolate chips together in the microwave or on the stove, stirring every 30 seconds until smooth. Allow to cool slightly and beat in the eggs, vanilla, and sugar. And the cocoa and salt and stir until smooth. Stir in the remaining chocolate chips and spread into prepared pan. Bake for about 35 minutes (the center might be slightly wet on top still). Cool completely before cutting. 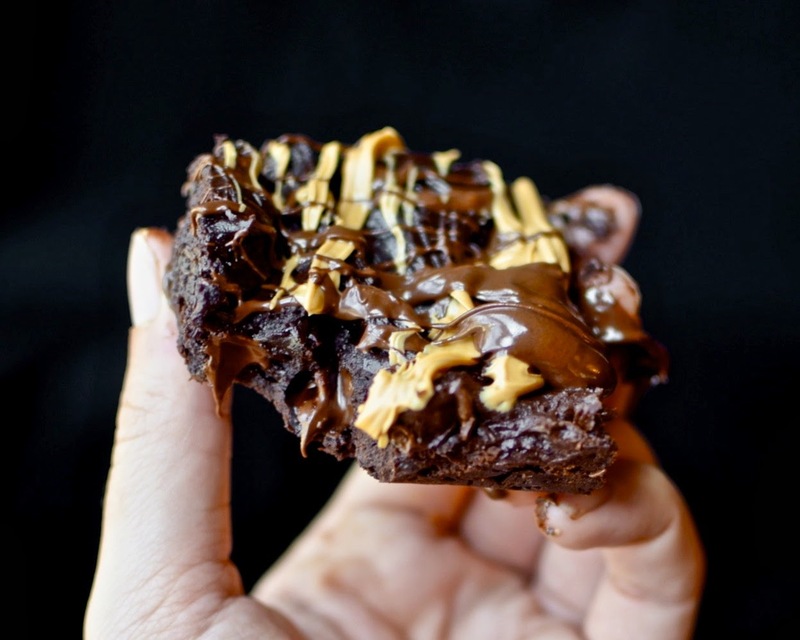 Drizzle with melted peanut butter and chocolate chips if desired. Don't forget to follow Yammie's Glutenfreedom on Facebook, Twitter, and Pinterest! These look amazing! I'm drooling. Just wondering if I can sub the white sugar with stevia in the raw? Thanks! did you try it with the stevia ACZ? Did it turn out good? Hi Yammie! My 15 year old son made these tonight. After getting started, we realized we were out of eggs, so I took flax seeds, ground them up and used 1 tb. ground flax + 3 tablespoons warm water for each egg I was missing. They still turned out great - very dark chocolaty and moist and fantastic. Thanks for another great recipe! Awesome! I'm glad you enjoyed them! 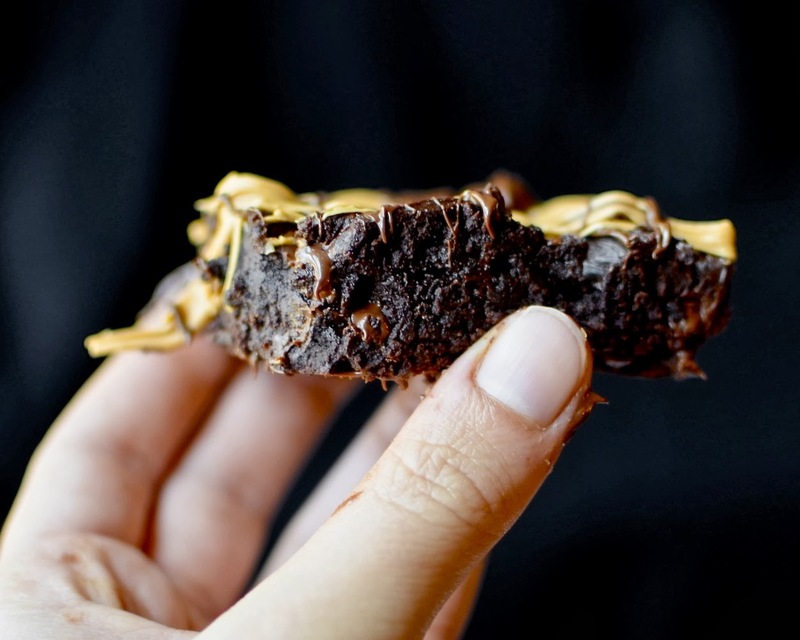 Hi, I was wondering if I could substitute the creamy peanut butter with almond butter? I really didn't like the texture of these too much and they could have done with more sugar. However my brother devoured the lot. They were easy to make and came out exactly as in the pictures. Also a cheaper recipe than most. If I make these again I may decide to smother them with mint frosting. Approx how many brownies did this recipe make?